235 mph in 5.8 seconds, ride along with Ian King and his onboard camera! We've uploaded some videos of the onboard camera footage taken whilst the subject of the forthcoming Discovery Channel documentary `Big Big Bikes'. The two clips are of the same 6.5 second 200 mph pass, but one taken on a helmet mounted camera and the other mounted on the frame just behind the supercharger drive. Please note that this is a LARGE file, 26 mb's (7 minutes videoclip) - broadband connection recommended! Ian King's fireball in Sweden. Click here for a video clip! They are the fastest accelerating machines on two wheels on the planet and will out accelerate all vehicles from a standing start (except for Top Fuel Cars) including Formula One Cars and even Thrust SSC and F14 Jet Fighters. These machines cost in excess of $150,000 to build. 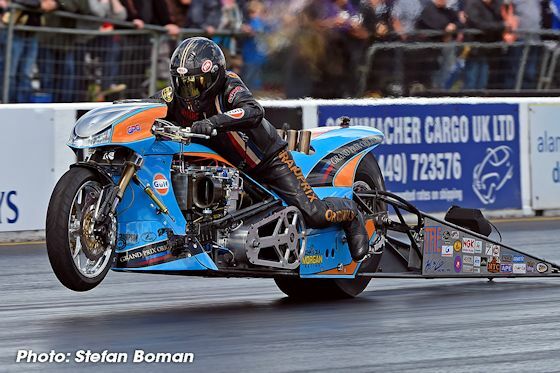 They have four cylinder purpose built engines, are supercharged, fuel injected, and consume over 15 gallons of the explosive fuel Nitromethane every mile. They have a gearbox with two ratios. Gearchanges are made by pushing a handlebar mounted button. 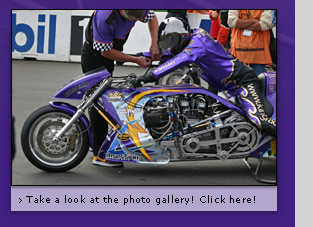 These huge motorcycles are an astounding spectacle, even standing still they look fast. It takes a special breed of person to ride them - there is absolutely nothing in the world of motorcycles to compare with them. 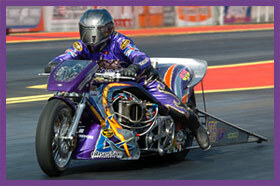 King Racing would like to thank our sponsors for their support! View the complete sponsorlist by clicking here.